Inside: I do a lot of home decor DIY and these are my 5 favorite places to buy fabric online. I get a lot of emails asking where I get fabrics that I use on different projects, so today I’m sharing with you, my most awesome readers, 5 of my favorite places to buy fabric online. I love browsing fabric online because you can pin your favorites and then see them side by side. What a perfect way to mix and match fabrics from different stores before you make your purchase right? Yes there are many places to buy fabric online, but these are my faves because they have great selection, great deals, and great perks! So here it is, the short list of where I buy fabric online most often. I hope they become your favorites too! The first time I ever bought fabric online was from Fabric.com and I was not disappointed. What I love most is the free shipping when you spend more than $49 which, for a fabric addict like myself is not at all hard to do. They have all types of fabric but I especially love their home decor fabrics. I’ve used home decor fabrics from Fabric.com on projects like my slip covered ottoman, my reupholstered dining chairs, and in my little mister’s nursery. They have their fabrics categorized by designer so if you know of a certain fabric maker that you like, you can browse that way. Or if you’re looking for a certain color you can search by color. I also love that they suggest coordinating fabrics, but I have to admit sometimes they’re a little too matchy matchy for me. If you are just getting acquainted with Fabric.com check out some of my favorite designers there: Michael Miller and Premier Prints. Online Fabric Store is another fabulous online resource for fabric. It’s so easy to find really great prints in this store and they carry one of my favorite fabric lines, HGTV! They also have free shipping when you spend $50, but keep your eyes peeled because they often have free shipping days and coupon codes noted right at the top of their site. This is one that very few people know about but it’s true. You can buy fabric online by the yard from West Elm! I discovered this awhile back when I made over this vintage chair. I had the dark grey herringbone fabric in mind for my project but couldn’t find it anywhere. It was by some happy accident that I discovered that I could buy the exact fabric I was thinking of by the yard and do the chair myself! Hot Dog!!! They don’t offer every single one of their fabrics by the yard, but they are a great place to go when you need upholstery fabric. Their furniture and the fabrics they use on them are high quality so you can get that same quality for your own project. They also have some of their popular prints available so you can sew up your own throw pillows or make drapes! One more thing to note about West Elm. I have more than once used their shower curtains for projects because they come in some great prints and they are a perfect weight for home decor projects like pillows and drapes. A total cheater, I know. But when this girl loves a print, I make it work! Want to see their shower curtains in action? Check out my DIY Grommet Top Curtains. Be careful with this one. It can be addicting! Consider yourself warned. Spoonflower is unlike any other fabric resource because the fabrics are designed by individual designers, not big brand names. It’s pretty much a collection of art in fabric form and you can search by color or by theme which is really fun. Back when I was doing my little boy’s nursery I would search themes like “typography” or “bicycles” and got so many fun ideas for his bedroom. You may remember the DIY Duvet Cover that I made for the Grand kid’s room over at my mom’s house. That duvet cover was a huge hit and I got so many questions about the teal watercolor chevron fabric that I got from Spoonflower. I’ll admit the prices on Spoonflower are a bit higher than the other fabric resources I’ve listed here, but you can’t find them anywhere else, so you’re paying for the uniqueness and supporting some uber talented artists. Most of us know about Joann stores and if you’re into any type of crafting or sewing probably frequently shop there, but when I discovered that you can buy fabric online from Joann.com I was so excited! And I was really surprised at the modern home decor fabrics that they have available! Joann.com has a great selection of home decor fabrics and they’are on sale frequently along with some basic use fabrics in all sorts of fun patterns. Joann is my go to for any DIY baby gift that I may be working on because their selection is huge and their coupons are so easy to find which really helps keep cost down. The secret (which was never really a secret) is out! Go get yourself some fabric online and get creating! Okay, I am piping in on this one. Joannes is terrible. Most all stores have been revamped and look nice, but their choices are horrible. Their prices are horrible also. Just a shame there are not more brick and mortar fabric stores to touch and feel, but that is the way the world is going. If your lucky enough to be near a Calico Corner fabric store you are in luck, however, the proprietors are bit stuffy IMHO. Fabric.com gets my vote, thanks for your post. Joannes is just not the ticket if you want fine fabrics. Darn shame. I appreciate your input, Beth. Have a great day! Hi Corey, this is great information, thanks so much! One question though: I’m not a master at fabric types and quality, so how would one assess a certain quality or weight of fabric for the right project? Is there a guide that can help with how to choose the right fabrics? Hi Susie, great question! There are many internet tutorials that can help you; just google “how to choose to the right fabric for…..” and insert what you are making (e.g. curtains, clothes, pillows, bedspreads). Nothing replaces touching and feeling the fabric, so either ask for fabric swatches if you’re shopping online, or go into your local fabric store for ideas. Best wishes! I just found an online fabric site called ‘Designer Fabrics for Less’. Can’t find any reviews on this site. Have you had any experience buying fabric from them? I have not Wendy. If you decide to buy, please let me know how it goes. I’m not happy to report a negative result but my most recent order from fabric.com was for a six yards of print fabric for bedroom curtains and six yards of drapery lining. Both pieces were short, ten inches for the print and the lining was cut sort of on the bias. I had to trim it 10 inches on one end and 4 inches on the other to square it up. They do accept returns, so check your order. I am looking forward to trying the other sources that you recommend. Hopefully their work won’t be so sloppy. Hey Cheryl, I’m sorry your order was incorrect and appreciate your constructive feedback. Please keep me posted on your other source experiences. I bought material at a fabric store in Michigan when I was on vacation. The fabric was for a Halloween banner to be cut out and backed with wonder under ironed between the fabrics. I loved doing it since it was a no sew project. I’d like to find more fabrics like that to make different holiday banners. I’m a decorative painter instead of a sewer-can anyone help with material like that? Do any of these fabric places deliver to Canada? Hi Janice, I’m afraid I can’t personally speak to whether they ship to Canada or not. Their websites should have a list of countries where they ship and what their shipping rates would be. For example, I found this list for Fabric.com. Hope this helps! I am looking for advice matching a fabric to a patterned tile floor and backsplash. Wondering if there is a FB page that people post pictures to for suggestions. thx! OOOOOOOOOOOOO Boy! You warned us about Spoonflower.com, but did I listen to you. NNNNNNNNNNNNOOOOOOOOOO! OMG! What wonderful fabrics. I found the peacock and flamingo fabrics that I’ve been looking for forever. That’s awesome Sandy! 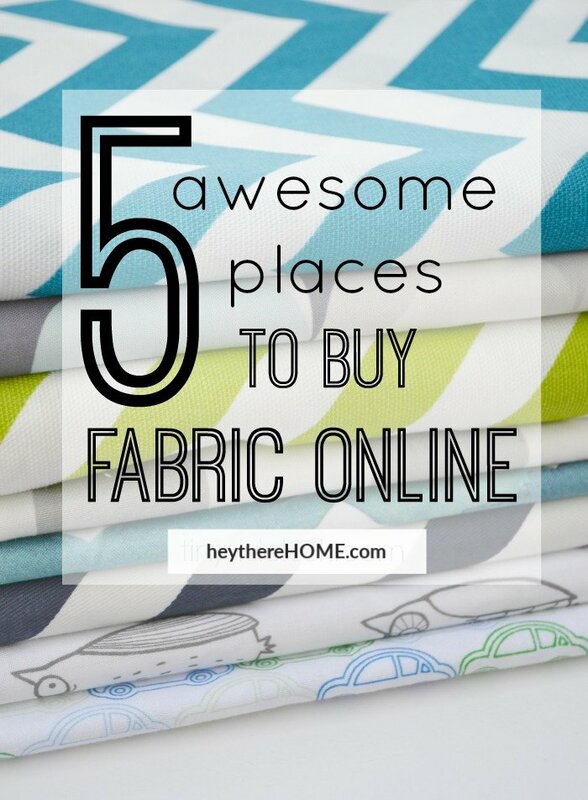 If you’re up for even more fabric indulgence, check out my brand new post 5 MORE Awesome Places to Buy Fabric Online! Ya I’ve been using spoonflower from back in the Etsy days and sometimes I find their prices on Etsy cheaper than their prices on their website. I guess because if Etsy see’s their rating go down they’ll get banned so I find when you order on Etsy the speed of delivery is much faster. Also be aware of the Etsy sellers online from China. It took 4 months for a small piece of fabric to come to my place in NYC. Horrible! Keep writing,Thank you for this. This is a great post. Thanks for your suggestions. Hi! I’ve personally been struggling with deciding whether or not buy material from onlinefabricstore.com since I’ve heard a lot of bad things about them and I’ve seen only bad reviews online. For a first-timer in online fabric shopping, would this website suffice for someone shipping to Canada? Hi Bridget, I’ve bought from them a few times and haven’t had a problem but I know what you mean, the reviews can make you feel uneasy. As far as shipping to Canada, I can’t personally speak to that. Sorry I’m not more help with that. I am looking for good percale to make sheets and pillowcases. Can’t seem to find it with a good thread count. I don’t like the fabric sheets are made of these days, I like a crisp sheet and pillow case and they only get softer with age. What do you suggest? Thank you. Hey Denise! To be honest, I’m not sure I’m much help with this question because I’ve never bought percale before. I do know what you mean though about not liking what sheets are made of these days. I just googled “percale by the yard” and there are sites that sell it, so you may want to start there. Let me know how it goes! Thank you very much. I really like to sew and this will make it much easier to find relevant supplies for my crafts. You’re so welcome Emily. Glad you found inspiration here! Great tip, thanks a bunch! Thank you so much for sharing this list. I’ve never bought online before, but my JoAnn closed last year, and I’m so very tired to going to WalMart (not the best selection). While I wish I could support my local craft shot, it seems I don’t have one anymore, so I really appreciate your advice. You’re so welcome, Maggie. Glad you found new inspiration here! Awesome suggestion save money for online shopping. thank you very much for share this article with us. it will be help! Thank you so much for the list. I’ve been strugling to find good online fabric stores for a while, but now I have a lot of options to choose from. Love them! You’re so welcome, Christine. Happy to be of help! Thanks for the comment, Ellen. Many people live in an area without a nearby fabric store, or their local store has a poor selection. Online fabric shopping is a huge help to them. I can understand your point, though. Hi, thank you for the great information, i’m new into fabric , can you please tell me what fabric works best for baby clothes in general? Hi Elham, I did a google search and came up with this: “For everyday children’s wear, cotton and polyester apparel fabrics are comfortable, safe, and easy to wash. Soft, fine wale corduroy is excellent for durable rompers and overalls for toddlers. Corduroy comes in 100% cotton and sometimes in cotton/polyester blends.” Hope it helps! There used to be a fabric store called the pink house that sold kick off fabric of what used to be OP the company OP . do you know where I could get my hands on some or where I could buy it ? I sure don’t Jeanette. But thanks for stopping by! Thanks for sharing the list. Its very helpful for the people who want to buy fabrics. And this is great information to read before buying. Hey Nicole. I just did a search and didn’t come up with anything that would work and look good for a dress. Have you considered dip dying your own fabric? Search pinterest for dip dye and you’ll find a bunch of tutorials to follow. You are so right, Spoonflower is positively addictive! I’ve been looking for fabric to redo an upholstered bench and found exactly what I had in mind on their site. Thank you! Hey Hannah! No. I love fabric.com. In fact they are my go to fabric source. I always get my order super quick and love that they only require $35 for free shipping. I’ve even done 2 returns with them and haven’t had a problem. Hope that eases your mind. I made the mistake of following your advice. I went to spoonflower.com You warned me, but I didn’t listen! It really is addictive!!!! I love Fabric.com too!!! Thanks again! Always fabric shopping for new patterns to make steering wheel covers . Fabric.com is one I use all the time. Love the free shipping offer when you purchase $35 or more. Hawthorne Threads has a great site, very easy to navigate and find just what your looking for. Joann Fabric is a given but not always as quick in keeping up with the current fashion trends. Etsy fabric shops are also a good source, too. I love shopping for fabric and gosh I have way too much but always looking for more. Thank you so much for this! I don’t live anywhere near a good fabric/sewing store and tend to buy a lot of fabric on Ebay because I’m just not sure where else to shop. I’m off to check out each of the online stores you’ve mentioned – so excited to find some great sources for pretty fabrics! Your projects are brilliant, I especially love the ottoman cover and the upholstery on the craigslist chairs. Thanks for sharing! Your very welcome Linda! Even living near fabric stores I have fallen in love with shopping for it online. I feel like I can take my time and see so much more. Have a fantastic rest of your week! Yes! In my experience I think they are cut better than at the cut counter! I hadn’t thought of it until you asked this 🙂 Happy fabric hunting! Thanks for Sharing your resources Corey. Great to have recommendations for online companies. Pinned!! Thanks for the tips Corey! I’d never heard of Online Fabric Store (seems so obvious 😉, but I’ll definitely have to go check them out! You’ve got some of my absolute faves here like Spoonflower and a few new ones that I can’t wait to check out! Fabulous round up Corey! Pinned for my next sewing project! I have been wanting to try to order fabric online. Thank you so much! Always on the lookout for great fabric spots! Thanks for sharing.